Diamond bands swivel to highlight either rubies or sapphires in this ring. Across the board, buying practices and attitudes reflect the current culture and the prevailing mood of the times. Removing clutter, downsizing, and simplifying our lives and surroundings are more commonplace, as diminished square footage and miniature condo areas force changes to be made. To maximize space at home, furniture designers have devised newer, space-saving devices serving a dual purpose√¢‚Ç¨‚Äúlidded benches or ottomans with hidden storage complement tables with hydraulic lift systems that can be raised or lowered to coffee table or dining height. Trouser bottoms can zip off below the knee to create a pair of shorts. From weddings to funerals to everyday wear, a decent suit, a flattering pair of jeans, a simple white blouse or shirt, and a classic black cashmere cardigan sweater, can be made suitably appropriate for almost any occasion. Multiple usage is the order of the day. Keep in mind the mantra for the latest millennium √¢‚Ç¨‚Äú reduce, reuse, and recycle. That crossover appeal also holds true for items of jewellery. Variety doesn’t only occur in terms of multiple pieces. Instead, it can be enjoyed with the imaginative use of a singular item with some diverse element to its design. It’s great to have a special, go-to piece that represents individual style, but it’s okay to spice things up once in a while, too. Your clients are most likely already aware of the need to reduce their environmental impact. However, steering them toward buying fewer pieces of better quality that provide versatility and do double duty or more can be mutually advantageous. Some of them will be intrigued and fascinated by the instrumentation and the finesse of the workmanship and manoeuverability of a Jaeger-LeCoultre wristwatch as they swivel their choice of faces. The physical mechanics of a collectible piece can be ergonomically satisfying, as well as novel. Substituting the central white pearl for a black one dramatically changes the look of a fabulous floral diamond-set brooch. To match every outfit, unscrew the bottom bead from drop earrings by Marina B and choose from the various esthetics of onyx, amethyst, carnelian, jade, and mother-of-pearl. Simply turning over a classic circular link necklace from Tiffany & Co., allows the option of silver or yellow gold. Antique diamond and ruby day/night earrings with removable pendant drops, circa 1875. 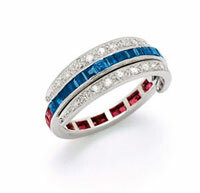 An ingenious ring designed with twisting bands highlights either a line of red rubies or blue sapphires. Probably the best known convertible design is that of the double-clip brooch, either worn as a single unit, separated on two lapels, or joined together. The Victorians had similar ideas in their love of day and night earrings with elaborate drop pendants detachable from a simple surmount. Take apart a necklace and voila√¢‚Ç¨‚Äúnow there are two optional bracelets. A tiara might comprise a riviere necklace, a set of brooches, and pendants. Remove the bejewelled ‘enhancer’ from a strand of pearls for a different look and more diverse wearability. A gemstone lapel watch temporarily hides its practical side. An aquamarine long chain can be worn wrapped once or twice around the neck, or even tied in a low knot to form an easy version of a sautoir. A highly sculpted brooch with hinged petals can resemble a rosebud or a blossom in full bloom. 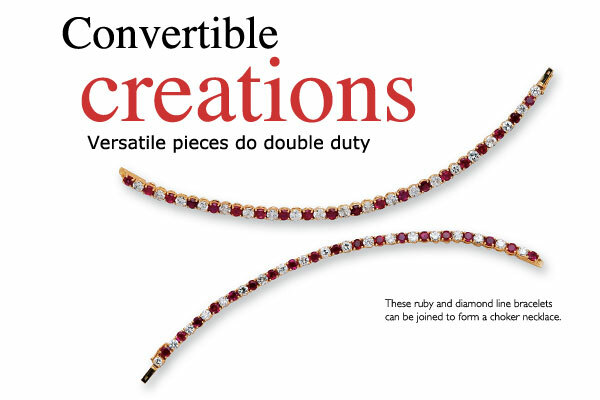 Guiding a potential buyer toward the practicality of a convertible piece and explaining the advantages and ingenuity involved in each design can help a customer stretch their buying dollars, similar to a two-for-one special. They might even buy more than one piece. Opting for versatility and variability with interchangeable parts allows a few carefully selected pieces to add up to a great jewellery wardrobe, as you educate your clients to pare down quantity, while raising the quality. Determine each client’s attitude and personal style, appealing to the minimalist, hipster, crunchy granola type, or luxe hedonist. Once you get a sense of their needs, wants, and desires, steer them toward convertible items that attract not only their design esthetic, but also their better nature. Your pocketbook and bottom line can reap the rewards. In effect, you’re assisting them to help save the earth and enjoy themselves at the same time√¢‚Ç¨‚Äúa win-win situation for the retailer, the consumer, and the planet.